Aaron Robinson sits at his harpsichord in his Alna home on April 14. The harpsichord has a picture of Leonard Bernstein on it. Alna composer Aaron Robinson didn’t have a personal connection to the November 2015 terrorist attacks in Paris that left 130 dead and 368 wounded. But the words of a witness who said “I’m numb with sorrow” triggered something in him. Robinson would go on to write “This Will Be Our Reply to Violence,” a choral arrangement composed of a single line from a speech by Leonard Bernstein given two days after the assassination of John F. Kennedy. Bernstein, a conductor, composer, educator and humanitarian, is one of Robinson’s personal heroes. The line from Bernstein’s speech, “this will be our reply to violence: to make music more intensely, more beautifully, more devotedly than ever before,” has been quoted extensively. No composer has ever been granted permission from the Bernstein estate to set those words to music, Robinson said. But the a cappella score, of voices repeating that one line, flowed from him. “This piece is my first piece that came from inside myself,” Robinson said. “It wasn’t commissioned or scheduled or programmed. As a composer and an artist, it was something I felt I needed to write.” He didn’t think there was much chance the composition would ever reach the public. On May 4, the Bowdoin Chorus, under the direction of Dr. Anthony Antolini, will perform the world premiere of “This Will Be Our Reply to Violence” at the Kanbar Auditorium in Brunswick. In a rare decision, the Bernstein estate granted Robinson two-year performing rights for the composition, he said. The world premiere will be followed by several performances of the piece by other choirs, but after two years, they will end, and the recordings will return to the vaults of the Bernstein estate, Robinson said. “I feel really lucky and really blessed” the piece will be performed, he said. Maine Sens. Susan Collins and Angus King have expressed formal support for Robinson’s composition. “Through your remarkable career as a composer, performer, and author, you are helping to elevate our nation as you bring distinction to our great state of Maine,” Collins wrote. 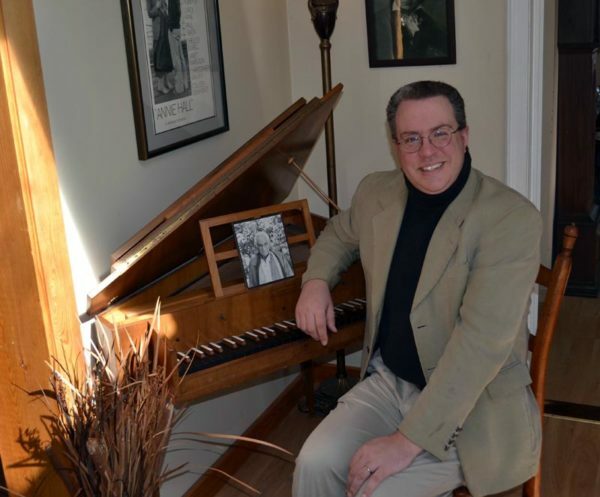 Robinson, a graduate of Medomak Valley High School in Waldoboro, started playing piano late in his teenage years. He attended the Boston Conservatory of Music, but he left before obtaining a degree. “I went out and lived the life of music,” Robinson said. Ragtime drew him to his career as a critically acclaimed composer, conductor and writer, but Robinson refused to be categorized by a single musical genre. From ragtime to classical to jazz to gospel, Robinson “kept moving” and made sure he “learned the craft” and his work was of “the highest quality,” he said. Robinson has written musical scores for television, film and theater, and he has conducted several works that have received critical acclaim, including Langston Hughes’ “Black Nativity: In Concert — A Gospel Celebration,” which became a best-selling Christmas gospel album and Broadway vocal score. He was nominated for a regional Emmy Award for composing the theme music to the Maine Public Broadcasting Network’s Maine Arts series. In the wake of the terrorist attacks, that one line from the speech echoed in his mind, and Robinson wrote a score to accentuate what the words meant to him. The score is strictly a cappella with no instrumental accompaniment. The piece starts with a C sharp, a note that could belong to either a minor or a major scale, Robinson said. The voices split during the piece, creating a sound experience of turmoil, but above it is a high soprano voice representing “pure, honest hopefulness,” Robinson said. The only words the voices sing is the one line from Bernstein’s speech, as a kind of “cathartic mantra,” Robinson said. The piece ends “with resilience and calm” in E major, he said. With E major relative to the starting note of C sharp, it is still not known whether the piece is in the major or minor key, Robinson said. With no expectations, Robinson sent the score to the Bernstein estate. He was shocked when they responded in early 2016, he said. Robinson’s score was the first time the Bernstein estate has received a request to set those words to music, he said. Robinson was given two-year performing rights. The Bowdoin Choir will be the first to perform “This Will Be Our Reply to Violence,” with additional performances to follow by the Vox Nova Chamber Choir. Antolini, a longtime friend, had planned to conduct “An American Requiem” since it was written in the mid-1990s, Robinson said. Antolini will bring the composition to life for the first time May 4. The speeches used in “An American Requiem” are fluid, and chosen by the conductor who is leading the orchestra that performs it, Robinson said. The score was purposely written so the speeches could be changed, part of the process of a composition taking on a life of its own and remaining timeless through changing times, he said. As the world premiere of “This Will Be Our Reply to Violence” approaches, Robinson said he hopes the piece will take on a personal meaning for those who hear it. “We’ve all witnessed tragedies,” Robinson said. While “This Will Be Our Reply to Violence” will only be performed for a narrow window of time, Robinson said he hopes the music will live on for those who experience it. “This Will Be Our Reply to Violence” will have its premiere at Bowdoin College’s Kanbar Auditorium in Brunswick at 7:30 p.m. Thursday, May 4. There will be an additional performance by the Bowdoin Chorus at 7:30 p.m. Friday, May 5. The Vox Nova Chamber Choir will perform “This Will Be Our Reply to Violence” on Saturday, June 24, at the Hannaford Hall in Portland, and on Sunday, June 25, at the Orion Performing Arts Center in Topsham.